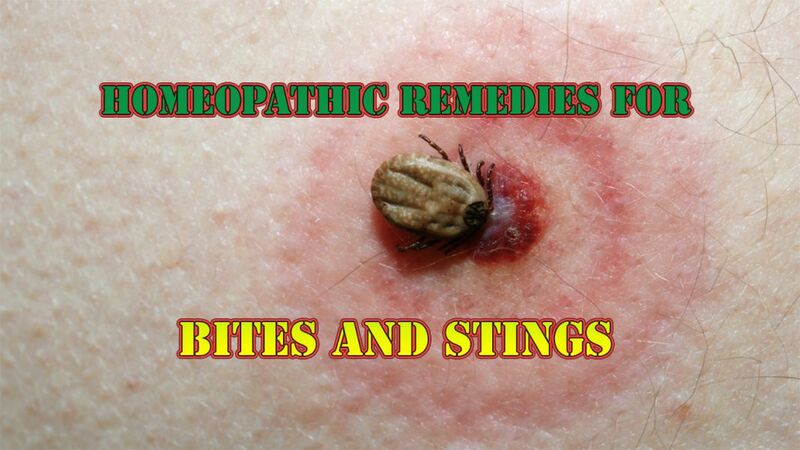 The following are the remedies for the various kinds of bites and stings. Bee-sting: Have the sting-removed. Apply locally carbolic acid or spt. camphor or mustard or kerosine oil or tobacco or snuff or a raw onion or Calendula or Ledum. If much swollen, Apis 6 internally. Scorpion-sting: —Locally the juice of unripe Ole (Amorphophallus companulats) or Kachu (Colocasia antiquorum). Mosquito or bug-bite or nettle-sting—Apply locally— Spt. Camphor, or lime-juice followed by lime (made warm). Apis 6 internally. Fish-bone—Dip in the part in water mixed with saltpetre. Caterpiller-sting—Apply locally the juices of “Kanchria” or “Madhu leaves” kachu or apply lime having scraped the part with a blunt knife or with fig-leaves. Foreign body in eyes—Never rub the eyes to dislodge foreign bodies. Evert the lid and rub it off with the end of your handkerchief rolled into a point. If however a caustic thing like lime or ash falls into the eye, at once wash it off with lime-juice or vinegar diluted with water or put in a drop of castor oil. Then bandage on the eyes and apply cold compress or hot water compress and lie on your back. Foreign body in nose—Have it removed by a competent doctor. Foreign body in ears—If possible, have it removed by a doctor. If it is something which will swell on addition of water, do not syringe it out; if otherwise, then try to syringe it out. In all the above three cases if pain is complained of give Arnica 3. For sudden asphyxia (or stoppage of respiration)— Due to whatever causes, such as hanging by the neck or drowning, put the patient prone, his head resting on his folded arms. Let all on-lookers go away, to allow pure air to come in. Then standing the patient astride squeeze his belly with the palms of both hands and compress the chest, 15 to 16 times a minute and then let your palms go. When respiration is established, give Opium 30; failing which give Antim. Tart. 30 or Lachesis 30. There is another way to inducing artificial respiration 15 to 16 times a minute. Put the patient on his back, his shoulders resting on a pillow, his neck falling, beyond the pillow. Pull forward his tongue and keep it outside the mouth. Stand astride the patient, at the head-end. Grasp the elbows and draw the arms well upwards parallel to the head; then fold back the arms and compress sides with patient’s elbows being well driven against the sides of his chest. If a man’s breathing has stopped in consequence of his being struck by lightning, apply any of the two modes of giving artificial respiration and as soon as he is able to swallow, give him Nux Vom. 30. For loss of sight due to being struck by lightning, give Phosphorus 30. Unconsciousness—If anybody becomes unconscious, at once do these—Clear away crowd of spectators to let in open air. Loosen all constrictions of dress. Lay him flat on his back or side. Never lift him up or raise his head; if possible, let the head hang down. If he vomits, turn his face to one side. So that he may not draw the vomit into air-passage. Dash cold water on his face; but never bathe him in water or keep him lying in a pool of water, with fans going on all around of him. Then apply medicines according to the causes of the unconsciousness—Due to grief, Chamomilla 6. Due to suppressed mental agony, Ignatia 6. Excessive anger, Aconite 3. Due to fear, Aconite or Opium 30. Due to severe bleeding, Cocculus 6. Due to pain, Aconite 6, Chamomilla 6, Coffea 6, Verat. Alb. 6. Due to drink or strong medicines, Nux Vom. 3x. Due to excessive use of Mercury, Carbo Veg. 30. Due to nausea, Ipecac. 3. If associated with dizziness, Chamomilla 6, Hepar 6. Due to fall, Arnica 3. Due to bleeding as a result of fall, China 6. Due to starvation Begin by feeding with small quantities of diluted milk at small intervals; then give soups; when consciousness returns and food does not excite irritation, give solid food in small quantities cautiously. Due to exposure to cold: Rub ice to extremities; when colour returns to them and the limbs become flaccid, put the patient on a bed and rub cold flannel and ply him with one or two drops of Spt. Camphor every 10 or 15 minutes. When consciousness returns, give Carbo Veg. 30, Ars. 30, or Acon. 3x. If unconsciousness is the result of any sudden strong mental emotion and is associated with pallor of face, give Apis 6 or Glonoin 6. For worms in children, Cina 2x-200. Mineral Acids (Nitric, etc.) Lime-water, chalk etc. Copper, Mercury and other salts … Egg-albumen, milk, water. Turpentine Oil or Croton Barley or arrowroot gruel. Lead Opium 1x, soap-suds, albumen, milk. Opium Bell. Ө, Coffee, Potash Permangnate. Opium-Poisoning: —Evacuate the stomach by means of pump or Zinc. Sulph. gr. 30. Then wash the stomach repeatedly with Pot. Permangnate solution, till the washings return unbleached. Let patient drink freely of coffee and keep him awake. Relieve his bladder from time to time. But do not march about the patient. He may have an occasional dose of Bell. 0 m. 5. Foreign body in throat: —Fish-bone etc. may be dislodged either by eating dry bulky food, like mashed potato or plaintain without chewing them, or by means of proper forceps. Fly Pest: Fly, mosquito, etc. are carriers of disease. To rid a place of them, keep pyrethrum in the room or let the vapour from milk mixed with formalin and cresol pervade the room. Cockraches can be removed by dusting the place with Borax. Snake-bite: —So much rubbish is written and spoken of regarding the so-called successful treatment of snakepoisoning, that it is necessary to say very definitely at the outset that the only sure remedy against snake-bite is antivenom serum—if that is injected within 20 minutes of bite. It often happens that a man dies more as the result of fear than of actual snake-poison ; and over fifty per cent cases of bite in the dark are not snake-bites, though supposed to be such and then again over fifty per cent cases of real bite, are not cases of poisoning—i.e., wherever snake bites, it does not necessarily belong to the poisonous kind, nor, if poisonous,it is in all cases capable to drop the poison into each bite. These account for the majority of persons bitten in the dark, getting collapsed from fear and recovering under so-called indigenous modes of treatment. It is also necessary to point out here that Pot. Permangnate is no sure preventive of poisoning. However, it is safe, in all cases of suspected snake-poisoning, to do these Tie a couple of firm ligatures, one inch apart, a couple of inches above the point bitten. Freely incise the part, following to their bottom the fang-marks and put in a few crystals of Pot. Permangnate. After the arrival of a medical man, undo the ligature according to his advice or else the part below ligature will die if kept tied unduly long. Administer stimulants freely and keep the patient in bed.